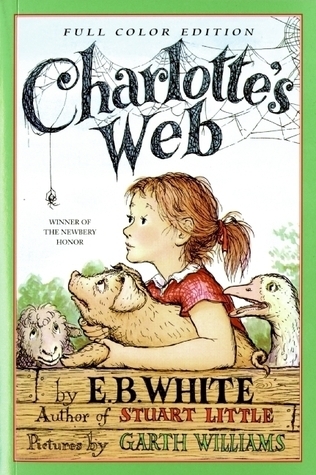 One of our family's reading traditions is that I read Charlotte's Web with each child the year before they start kindergarten. I don't know if anyone but me would even recognize this as a tradition, to be honest. It's one that I treasure, but we sort of fell into it. I have always loved the story of Charlotte's Web and wanted to share it with my oldest son. It just so happened to be around 6 months before he started kindergarten. It also just so happened that while the book was right at his 4 1/2 year old attention span, his younger sister was not nearly as interested, being only 2 at the time. That was okay, though, because it provided the two of us with some special bonding time sharing this classic book. Well, I couldn't let my daughter miss out! So when she was getting ready for kindergarten, I read it with her, too. Big brother was already in school all day, so he wasn't around for a second dose, and little brother was still just a baby. Once again, we had a great experience reading it and talking about it together, just the two of us. Just recently it was little brother's turn. (I can hardly believe it!) I pulled it out a few weeks ago for us to read while the older two were in school. It was so enjoyable to share his delight with Wilbur's antics and the other animals in the barn. He was quite worried when we stopped on the chapter where Wilbur finds out what the humans have in store for him. I kept reassuring him that Charlotte would find a way to save Wilbur, but he was anxious to get back to the story to learn how she would do it. This is my boy who more often than not, checks out board books from the library instead of picture books. (Boy, will he be excited when the new baby comes and I get down our very own box of board books!) We read picture books together too, but he's never requested a chapter book until we started reading this one together. Once we started, he wanted to read it every day. My little guy didn't have much to say about the ending. However, as soon as we finished, he asked if we could read it again. I don't remember the other two doing that! What reading traditions do you have in your family?